A Barrier to Proposition 1? Some environmental groups support the bond measure because it would help water-quality efforts, but many other organizations oppose it, mostly because it would finance new dams. Prop 1 opponent Gordon Becker. In California's ongoing water war, this year's election battle has an unusual lineup of participants. Supporting Proposition 1, a $7.5 billion water bond measure on the November ballot, is the usual flood of money poured in by billionaires and corporate agricultural interests who want to build more dams and larger reservoirs. On the other side, with only a trickle of funding, are environmental organizations and advocates for the fragile Sacramento-San Joaquin River Delta. But this time some environmental organizations are teaming up with the wealthy agricultural interests to support the measure, while the granddaddy of California environmentalism, the Sierra Club, has decided to remain on the sidelines of the fight. Prop 1 supporters, led by Governor Jerry Brown, contend that it will ensure a reliable water supply for farms and businesses during severe droughts. The measure also includes funds that supporters say will be used to clean up drinking water; divert more water during wet winters into reservoirs and underground aquifers; pay for more flood control projects; finance restoration plans for rivers, wetlands, and watersheds; and support water recycling and desalination programs. These provisions have drawn support from some environmental organizations, including Clean Water Action, which backs Prop 1 because "it provides money for very badly needed improvements to water supply and water quality efforts," said spokesperson Miriam Gordon. But Gordon acknowledged that the controversial piece of Prop 1 is the $2.7 billion it would set aside for "storage" — a provision that opponents say will likely fund the construction of costly, environmentally destructive dams. Gordon, however, argues that environmental groups will be able to block any dam-building after the measure passes. Because "groundwater storage is a more realistic solution, we believe rational arguments will prevail," she said. Sierra Club officials, in explaining their decision to neither support nor oppose Prop 1, also praised the "very substantial environmental benefits outlined in the bonds," such as groundwater and watershed restoration projects. On the other hand, club officials wrote in their official statement on the measure that "we hate the dam funding ... . Spending $2.7 billion — more than one-third — of the $7.5 billion bond funds on an old-school, unsustainable approach to water management just doesn't make sense." Opposition leader Barbara Barrigan-Parrilla, director of the conservation group Restore the Delta, agreed, arguing that the measure also shortchanges more sustainable and effective ways to deal with drought, such as wastewater recycling. And it provides no funding for fixing leaky pipes, which are responsible for more than 10 percent of California's water supply's losses. Besides the dams, she said, the measure would fund other projects that either do nothing to improve the water supply or risk making things worse. "We don't believe you have to swallow a whole bunch of bad to get the good," she said. Proposition 1 emerged as a last-minute legislative compromise — a scaled-down version of an earlier $11.14 billion proposal. Negotiators hammered out the something-for-everyone plan in the hopes of getting the two-thirds vote needed in the legislature to put Prop 1 on the ballot. In the end, it passed with almost unanimous support. Supporters tout Prop 1 as being fiscally responsible because it doesn't raise taxes. Instead, the funds required to pay off the $7.5 billion bond plus interest will come out of the state's general fund. The Legislative Analyst's summary of the measure states that repaying the bonds will cost the state $360 million a year for forty years. Proposition 1 is endorsed by both the Republican and Democratic parties, the California Chamber of Commerce, and many business organizations, water agencies, agricultural organizations, construction unions, and some environmental groups. Numerous environmental organizations and fishermen, however, oppose the measure. Although Prop 1 doesn't specify which dam-building projects it will fund, spending decisions will be made by the California Water Commission, an agency that Barrigan-Parrilla said has been "biased toward dams and reservoirs." In addition, according to the Sierra Club's statement on the measure, the measure is "written to favor surface storage [dams and reservoirs] in the Central Valley, including three projects the Sierra Club has opposed." One of those projects would make Shasta Dam larger, and the other two involve building new dams. One of the new proposed dams — the Sites project — would take water from the Sacramento River upstream of the delta to create a large reservoir that will "flood habitat for 23 endangered species," said Sierra Club spokesperson Kathryn Phillips. Enlarging Shasta Dam, meanwhile, means making Lake Shasta bigger, thereby flooding villages and sacred sites of the Winnemem Wintu Tribe. The other proposed dam — known as Temperance Flat — would take water from the San Joaquin River, which Phillips noted already supplies "plenty of dams that are not at capacity." Representatives of the California Sportfishing Protection Alliance argued in an opposition statement to the measure that compared to these three dams "equivalent expenditures in conservation, recycling and reclamation would produce far more 'new' water in less time, while creating 2-3 times as many jobs." Opponents also say the dam projects would continue the failed strategy of shipping water from northern rivers to the San Joaquin Valley and Southern California and would do nothing to help fragile fisheries. Instead, the state should use its funds to promote "regional water self-sufficiency," said Conner Everts, director of the Environmental Water Caucus, an alliance of forty environmental organizations statewide. Everts, who has worked on numerous Southern California water conservation projects, noted that many of them have never been completed, due to a lack of funds. In addition to water recycling projects, building large-scale graywater systems, capturing rainwater, and replacing leaking pipes could drastically cut water use, he said. Because of such measures, "Australia uses thirty to fifty gallons of water per day per person," he said. "California's statewide average is now two hundred." While some environmental organizations are focusing their opposition on the proposal for new dams, Barrigan-Parrilla argues that there are problems with other parts of Prop 1 as well. She pointed to the $1 billion that would be set aside for "conservancies," which she argued "have nothing to do with restoring watersheds or drought relief," but instead fund projects such as new parks and hiking trails. Although these are worthy proposals, she said, "It's a bad principle to include them in a water bond during a time of extreme drought." Barrigan-Parrilla also fears that some environmental-restoration provisions in the measure could allow for-profit water speculators to game the system. She recalled revelations in 2009 that wealthy agribusiness owner Stewart Resnick had been able to buy water set aside for environmental restoration and sell it at a profit to developers in the Mojave Desert. Although the measure states that none of Prop 1 funds can be used to divert water from the already-stressed Sacramento-San Joaquin Delta, Barrigan-Parrilla worries that some provisions could be used to benefit such projects. 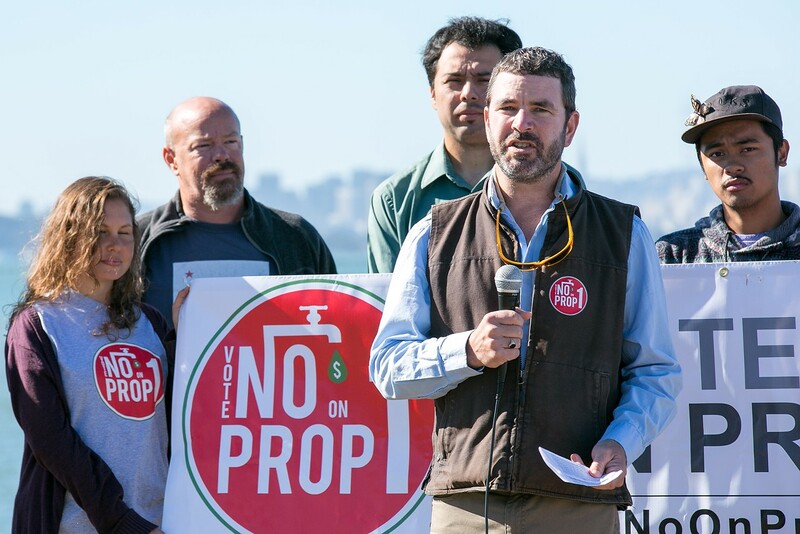 Phillips, of the Sierra Club, contended that Prop 1 contains sufficient safeguards against such manipulation. "The language in this bond measure allows more oversight than in previous bond measures," she said. "But it will take watchdogging." Barrigan-Parrilla disagreed, arguing that there's not enough accountability in the measure for how money will be spent. The measure lays out goals, but various administrative agencies will decide on specific projects. "The money will go to the most powerful interests," she argued. Previous bond measures, she said, were billed as providing clean drinking water, flood protection, coastal protection, and so on, but the money "mostly went to Big Ag or is still unspent." Instead, Barrigan-Parrilla said, the legislature should appropriate money for specific projects "so there will be legislative oversight over where the money is going." She said Colorado and Idaho are "taking a look at where they put water" in a statewide planning process. "If California did that," she said, "the Bay Area, Los Angeles, and the fish would win."